This classic book was first published in 1986, and is now out of print. 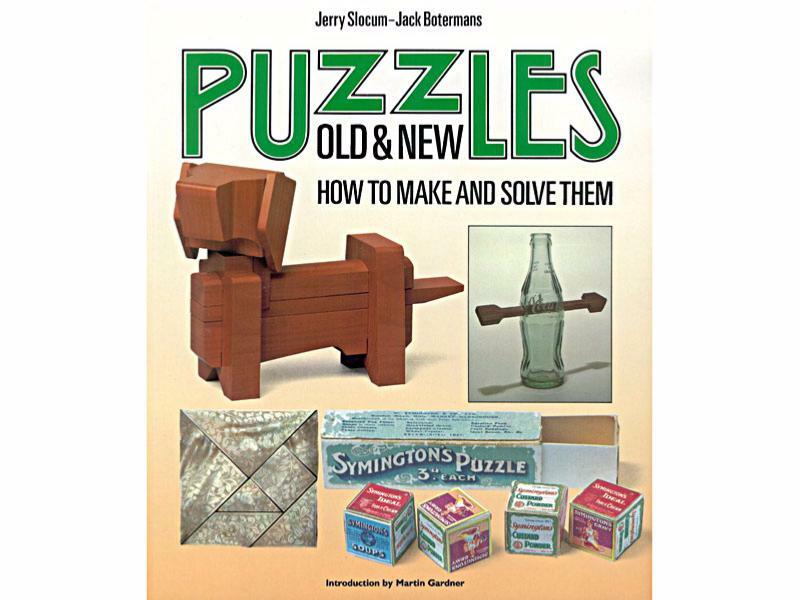 Written by Jerry Slocum and Jack Botermans, with an introduction by Martin Gardner, the book looks at a wide range of mechanical puzzles, and contains instructions for making and also solving them. Profusely illustrated, with diagrams, and black and white as well as colour photographs, the book is endlessly fascinating for anyone interested in mechanical puzzles. A quick search of the web (April 2013) shows new copies of this book being sold at prices starting from GBP92.75 .So we are delighted to be able to offer this classic book at only GBP10. However our stocks are limited, and once they are gone, we will not be able to get any more copies. Paperback. 265 x 230mm. 160pp. Bought this as a present for my husband & he seems very happy! Book ok. Would like a more current book or instructive media. Just browsed so far, but found a picture that lead me to identify an old metal tennis racket and ball was! Lots of great information here. A wonderful book, a prize. Just flipped through the pages, it looks interesting... exactly what the cover and the description on the site promised.